Don’t be scared by the name. 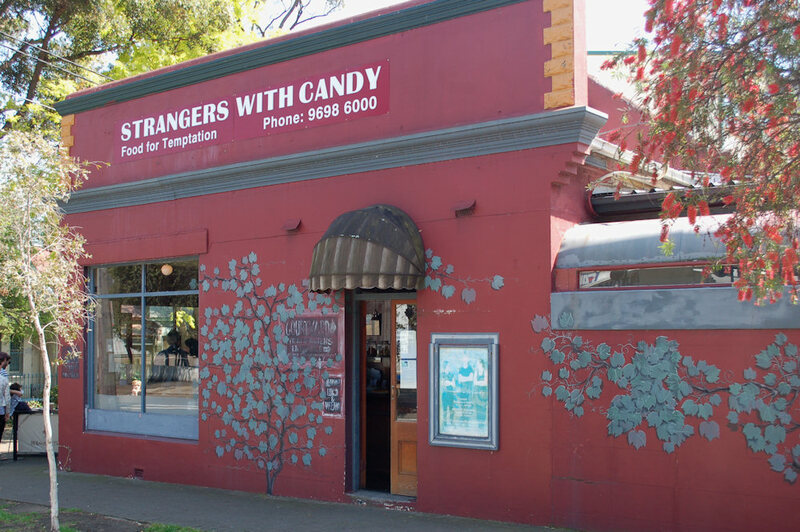 The staff at Strangers With Candy are really quite nice. As we approached, Justin Wells (co-owner) was setting up two tables outside which was perfect timing for us! Our waiter and waitress throughout the morning were extremely helpful and presented us our meals with a smile on their faces. There are numerous tables inside the café and through to the outdoor courtyard. As opposed to a large selection of pre-designed meals, Strangers With Candy prefers to provide its guests with a list of the more popular components of Sydney breakfast and encourages you to design your own. 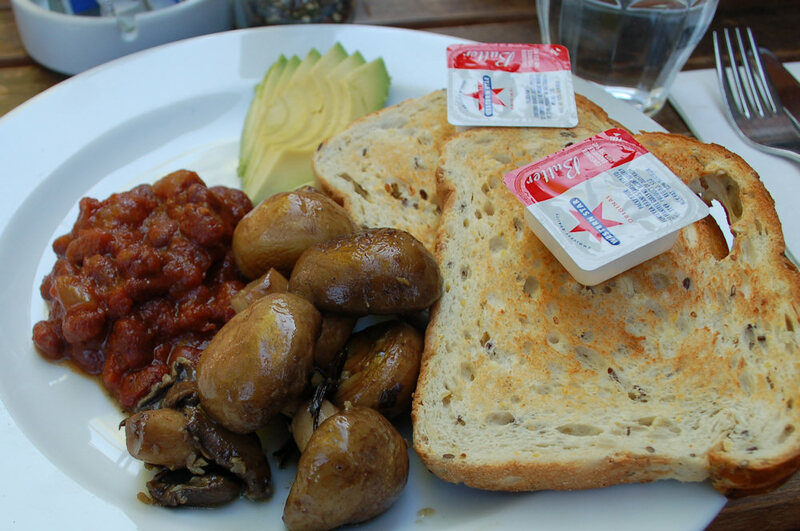 Yes you can order toast or eggs (poached or fried) but you can then add vegemite, jam or marmalade to the toast as well as bacon, prosciutto, tomato, avocado, double smoked ham, chorizo sausage and many more to the eggs. 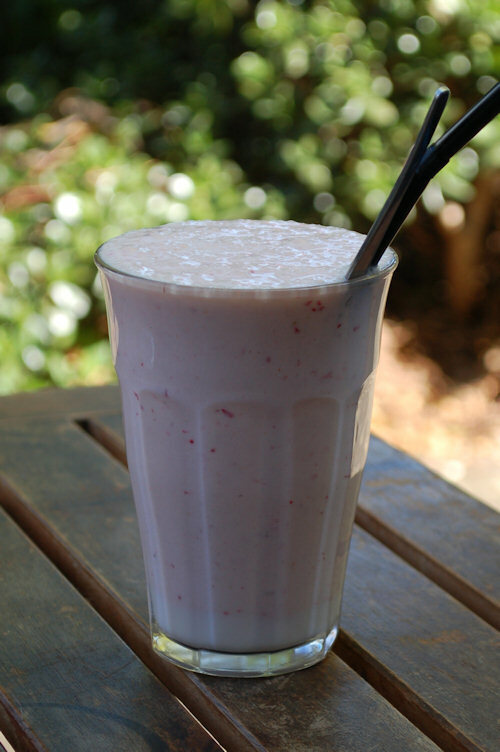 The smoothies are available with banana, passionfruit and/or strawberry. We ordered a banana and strawberry smoothie ($6) which we enjoyed thoroughly. With honey and a (tart) yoghurt thrown into the mix, the use of fresh ingredients was obvious. Not content with just using a straw, there were chunks of fresh fruit that encouraged us to use the provided spoon to eat them. If you could get love in a glass, this would be it. 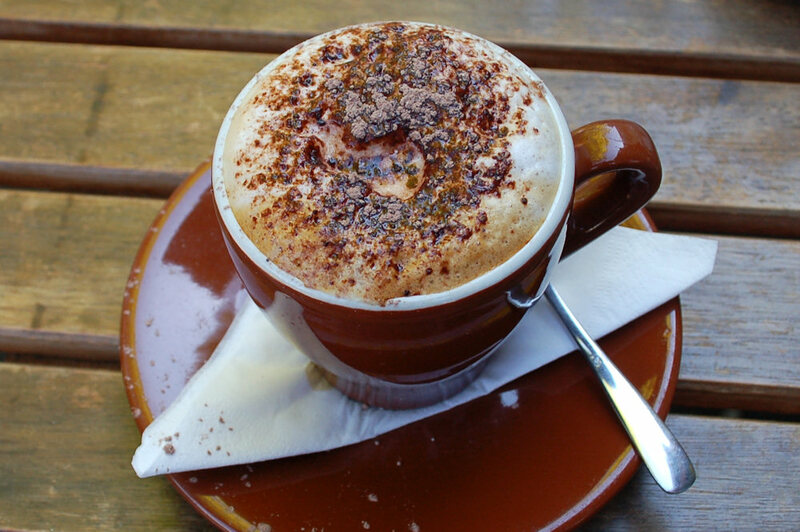 The skim cappuccino ($3) reminded us of the ones our parents used to drink in the 80’s. It was served with an amazing amount of froth on top and they didn’t skimp on the chocolate. 3 of the 4 diners at our table ordered them and one went back for more. Mmm… coffee. There are three toast options: Turkish, multi grain or “fluffy white”. 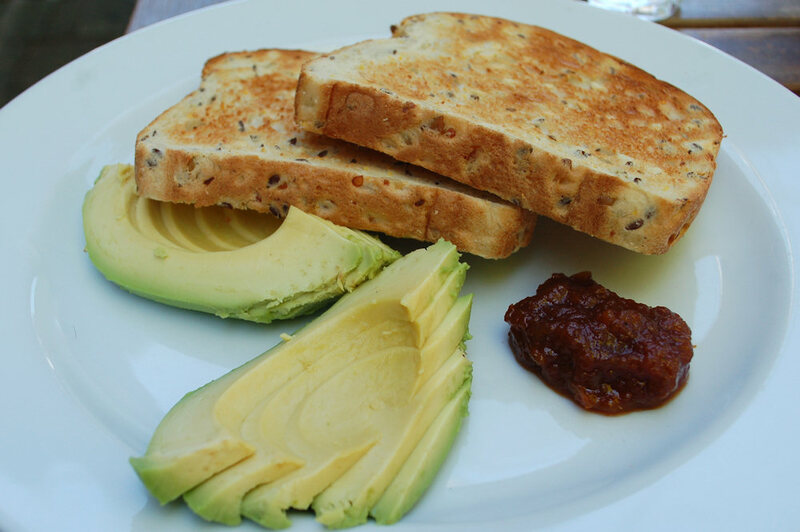 One of our guests ordered the multi grain toast with avocado ($5.50 + $3.50). To her delight, the avocado was ripe, unbruised and served elegantly. The accompanying tomato relish was a nice touch and quickly became a hit at the table. This is where so many nice looking additions can get dangerous. 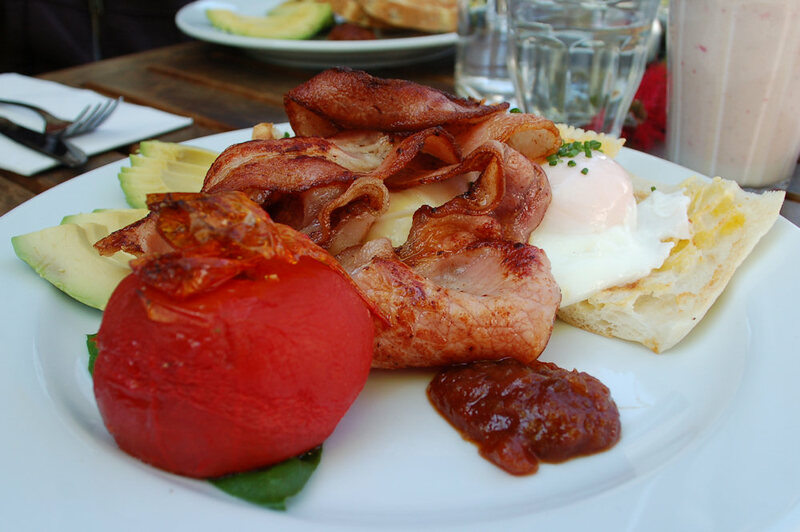 To his poached eggs with Turkish ($9.50), Dane added bacon ($3.50), oven roasted tomato ($3.50) and avocado ($3.50). This raised the price to $20 which is more expensive than the “big breakfast” at a lot of other establishments. But… was it worth it? God yes. Not only can we recommend this above combination but every component tasted so good by itself and together. The eggs were poached just the right amount. The bacon, avocado and relish with the egg and Turkish was out of this world and made for a fantastic meal. The skin of the roasted tomato was peeled off and cooked on top. Who could have known that tomato skin could taste so good – the herbs and well-done crunch were what made it. The flesh of the tomato itself peeled back to reveal the layer of seeds and centre inside. We felt like there was always more to explore on this plate. They are a modest bunch at Strangers With Candy. The simple sounding tomato and fresh basil bruschetta ($14.50) arrived with more ingredients than we expected. The dish had a side serving of smoked eggplant which reminded us of baba ghanoush. Beneath the tomato was a thin layer of goat’s curd which complimented the tomato and basil. 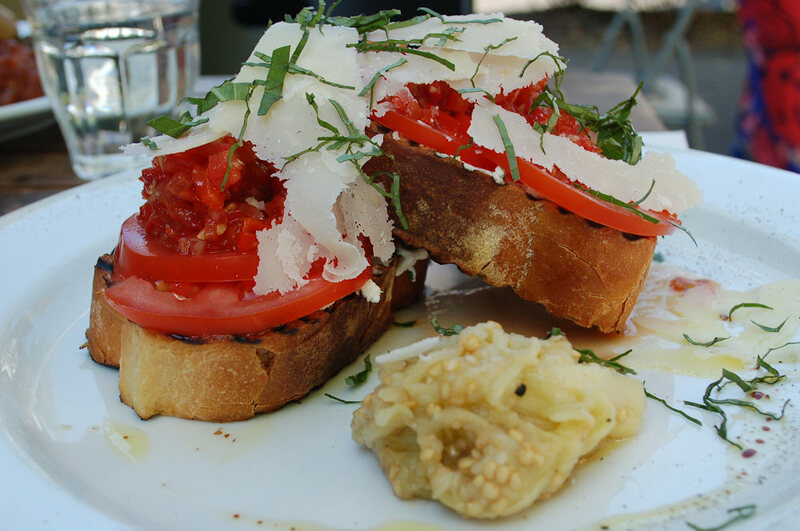 The toast was crunchy and not too tough and the dish was topped with a generous amount of parmesan cheese. One suggestion from our guest is that is should be served with a steak knife as the toast is so thick. April was excited to try the homemade baked beans ($3.50) so she ordered them with multigrain toast ($5.50), rosemary mushrooms ($3.50) and avocado ($3.50). The beans were served in a chutney like sauce which was surprisingly fresh tasting and delicious. The mushrooms were juicy and the avocado ripe and soft. The unsightly butter ruined the dish (see above) why do they serve it like that? A slither of butter from a block, or ‘would you like butter with that?’ would do fine. There are a number of mouth watering, home-made desserts on display at the counter. 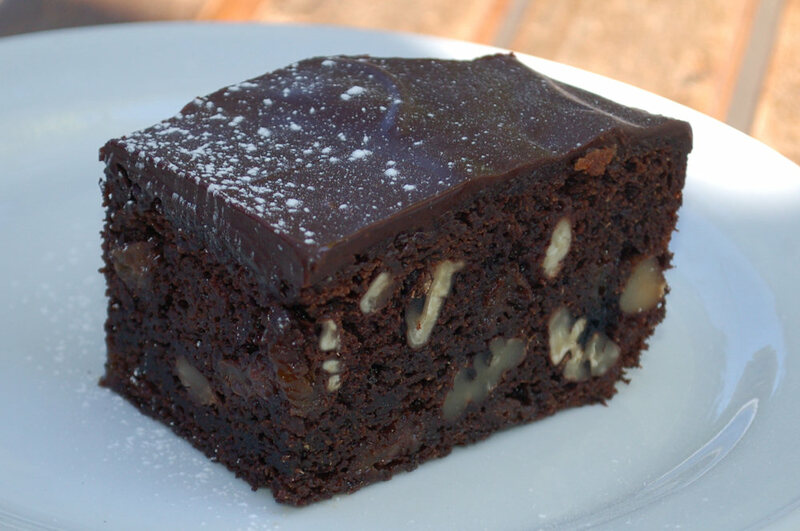 We tried the chocolate brownie ($3.50) which wasn’t as chocolatey as we would have liked but tasted great nontheless. This particular recipe had pecans and fruit mixed through it which we weren’t used to and a soft layer of chocolate icing on top. 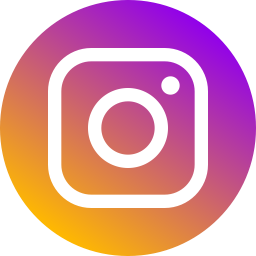 The Strangers With Candy website lists flattering quotes from reputable sources such as The Good Food Guide and Sydney Morning Herald Good Living. Don’t be scared off by the location, we were seated outside away from the main road in a lovely leaf lined street. Bookings are available for breakfast, lunch or dinner and we suggest you call ahead. Other indulgent dishes we are keen to try include the smoked salmon, horseradish cream and eggplant caviar bruschetta ($18.50) and the fruit salad with toasted almonds and yoghurt ($12.50). It seems the genius of the chefs finds its way into the lunch and dinner menus too which we’re sure continues the high standard and attention to detail we noted in our breakfast. Put this café on your breakfast hit list.